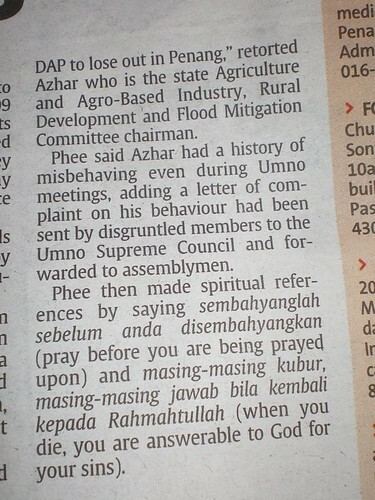 I can’t find the online version so here’s a snapshot of the article. 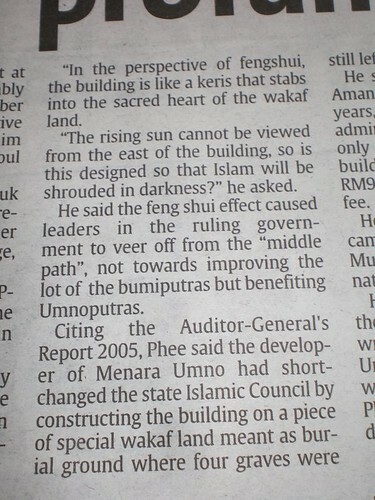 It says…’keris-shaped Menara Umno ..weapon stabbing into the heart of Penang…..
Hey, aren’t they also building an even longer keris in the heart of Malacca town? Didn’t they consult Lilian too? 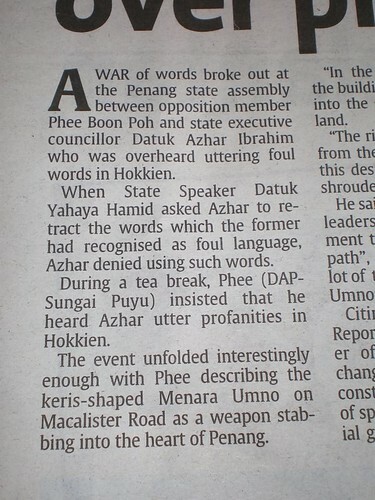 of the war of words between Datuk Azhar Ibrahim who must have said, pukimakhang or kanneh or whatever to DAP Phee Boon Poh. Shouldn’t we be proud of our muhibbah spirit? That other races can speak Hokkien as well? Next Next post: Psst..let me tell you a secret…Queensbay’s Mall is haunted.. This is good. I think everyone shud consult Lilian too. I did, and i saw my wealth prosper. Am i right in saying that, Master Lilian. HAHAHA!!!! Samm – LOL, ya, this Lilian too very good in fengshui in earning money. QV – I just can’t seem to find the online article on The Star, Metro North. Wonder why. hahaha this is freaking hilarious. but even with the building being there, i don’t there’s much can be done rite ? i think the ruling party is under so much criticism lately. furthermore Michael Backman had another article just 2 days ago … hehe. QV – I just canâ€™t seem to find the online article on The Star, Metro North. Wonder why. satkuru – Hehehe, I went through like three times and can’t see the title on Metro North. Wonder why? But looking at snapshots seem more ‘authentic’ than copy and paste. Hahaha. 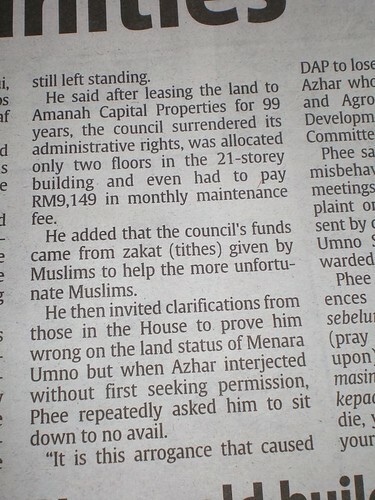 to Datuk Azhar, wahh apa la lu! kasi wa paiseh saja! buat malu kompeni! dah la nama pun mau sama! iskh! Why would he use foul language is beyond me. Maybe we should send him back to kindergarten?